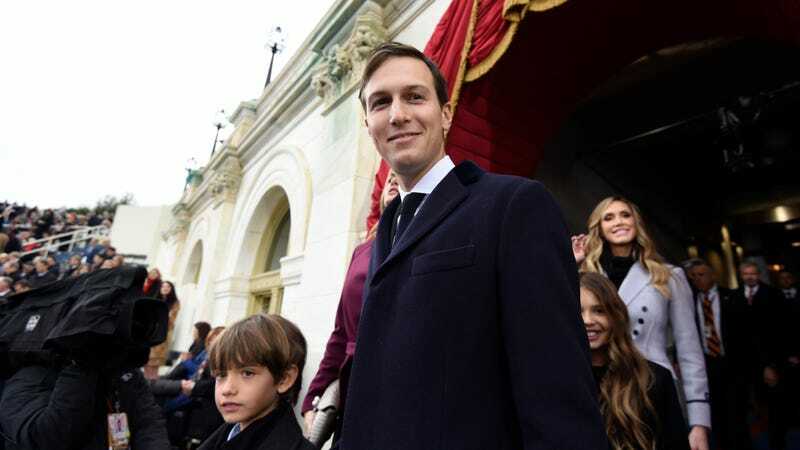 Jared Kushner, son-in-law of President Donald Trump and close personal adviser despite a galling lack of experience, is now under scrutiny by the FBI in the investigation into Russian meddling in the 2016 election. Last week, the Washington Post reported that a current White House official was a “person of interest” in the investigation but declined to identify who that person was. NBC News reports that investigators now believe that Kushner has “significant information” that’s relevant to the investigation. Please feel free to add this new development to your constantly evolving suspect board of red string and computer printouts tacked to a cork board in your bedroom. The Post reports that Kushner is currently being investigated “because of the extent and nature of his interactions with the Russians.” For those who have perhaps blacked out some of the details of this situation or who have willfully chosen to forget, Kushner met with Sergey Kislyak in December of last year as well as Sergey Gorkov, the head of Russian-state owned Vnesheconombank. These meetings and dozens of others were conveniently omitted from Kushner’s security clearance forms, due to what his lawyers say was a mistake. Most interesting about this development is that Kushner is different from the investigation’s other subjects,Michael Flynn and Paul Manafort. As we’re all painfully aware, Kushner is a current member of the administration and one of Trump’s most trusted advisers. With Kushner now a focus of the FBI, could it be that the call is coming from inside the house? The Post clarifies that even though he’s now the “focus,” he’s not the “target,” the latter of which would indicate wrongdoing. Kushner has yet to be accused of any actual crimes, and is not the main suspect in this unwieldy and headache-inducing investigation. Regardless, this is still fishy as hell.